Who? You might well ask. One thing Ganxy never did was blaze a trail across the ebook universe. But it did provide a bespoke service for authors and publishers, and will be missed. Given it’s on its final countdown I won’t spare too much time here explaining what Ganxy is (or was, if you’re reading this in the new year), but if you’re interested, click on this link to see the Ganxy site in action before it brings down the final curtain. In another life as a novelist I used Ganxy to bulk-sell ebooks to school libraries, by-passing the big retailers like Amazon and collecting a healthy royalty. 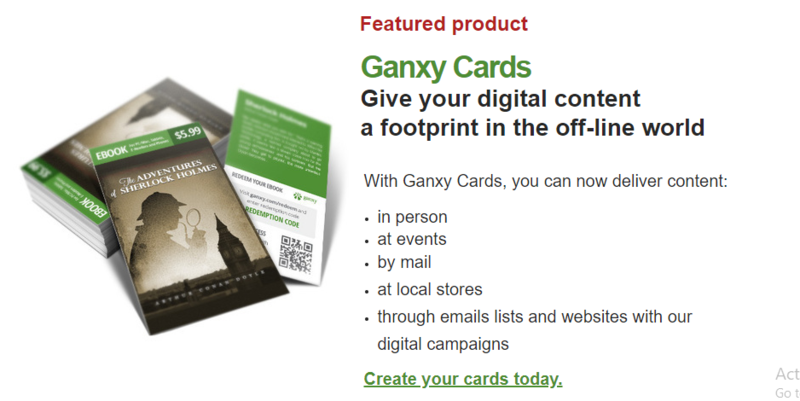 Something I always wanted to try, but being in West Africa never had the chance to, was Ganxy ebook cards. Those, along with many other benefits of Ganxy, will fade away this December. The news came in an email from Ganxy today. Ten years ago, we set out to create a better independent distribution and monetization platform for publishers of digital products. We also believed that the user experience of acquiring digital products could be smoother, safer, and private. We’re proud of the platform we built with minimal resources, but even more so, we’re grateful for the community of users and publishers that enabled our endeavor. Unfortunately, due to the changing reality of the economics and de facto oligopolies in eBook and music distribution, our story is ending. Though many challenges in the world of digital products remain unsolved, and while we considered every option before making the difficult decision to cease operations, the simple fact is that we can no longer do it. Therefore, we’re issuing a thirty (30) day notice of termination of services. As of December 29, 2018, all our operations will shut down and will no longer be available. Payouts from sales of products will be processed subject to available funds as part of our winding up and dissolution process. Thank you for using the Ganxy platform. It has been a privilege to serve you. RIP Ganxy. You will be missed.